Yesterday was Adelaide’s third birthday. We had a party for her and this morning I was looking through the pictures. Kids are pretty amazing and grow up so fast. 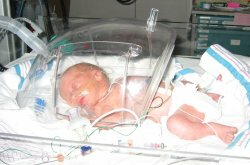 Here she is, three years ago, one day old, on March 1, 2006. She is in the Mercy NICU in Cedar Rapids, IA. (Side note: This is the hospital where Nancy works.) (Side, side note: yesterday, 2/28/09, Mercy imploded one of their building that was damaged in the flood of 2008. It was a big deal for Cedar Rapids: the first known demolishion by implosion.) She was born at 32 weeks, 8 weeks early. She stayed just 2 weeks in the NICU and then was strong enough to come home. Here she is, three years later, at her third birthday party yesterday. She wanted a pirate themed party. (She can see just fine with both eyes. 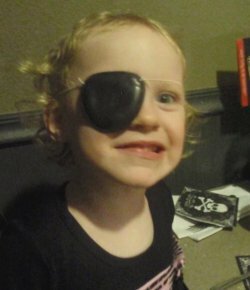 But pirates need an eye patch, of course. And they have a scowl and say, “Argh!”) You wouldn’t be able to tell that she was a preemie.